So happy to start again a new project after 10 months disability! The good thing is that I had all my time to mentally prepare it! 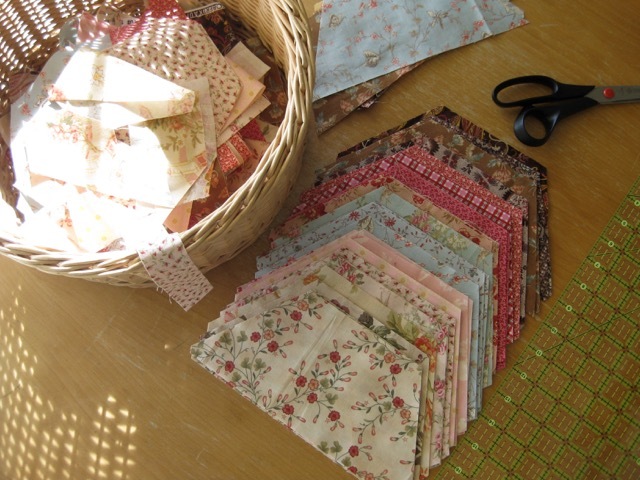 So I had decided for this new quilt to only use fabrics from my stash, choosing my favorite hues (pink, blue and brown), among my reproduction fabrics. I assemble hexagons, using the half hexie technique. It's a very quick and efficient method. I will write a tutorial in a next post. Oh, they look lovely! So glad you are feeling better and able to work on your project. Take care! ces tissus sont de toute beauté, une merveille se prépare ; bravo! Lovely project. So glad you are up and about! What an interesting technique! I'll be looking forward to your tutorial. SEW glad you are able to quilt again, Christine!! I love the colors in this quilt. Those melons, corals, salmons, peaches, pinks -- one of my favorite color ranges. Beautiful. Glad for you you can enjoy your sewing again. SEW glad you are feeling the urge to sew. 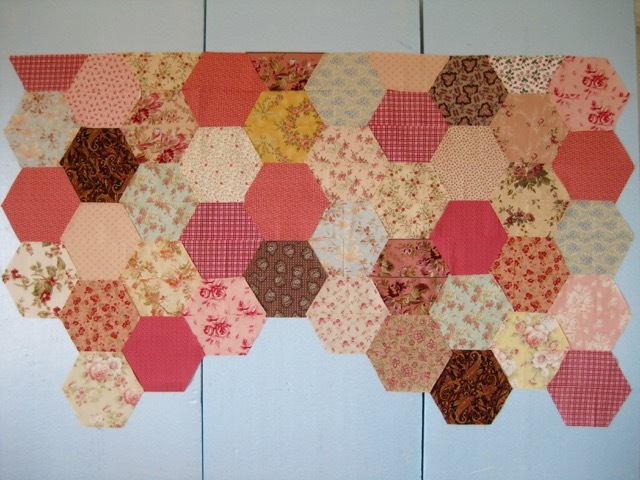 I don't think I have ever seen a quilt made of half hexies. I was trying to determine the size of your pieces. I am going to enjoy seeing your tutorial of how you are making this quilt. Hello Christine, glad to hear your good news! Your fabric combination is beautiful as always! thank you Myrto, I hope you are well! It's beautiful, Christine! You have a very tasteful, yet playful, way of putting colors and fabrics together. Beautiful!! Glad you are feeling better and I am looking forward to seeing more posts when you are up to it. I'm so happy to see that you are back again. The knit creations you made during your recovery were lovely, but it's good to see that you feel well enough again to make quilts. What a blessing! What a happy, colorful piece, Christine. 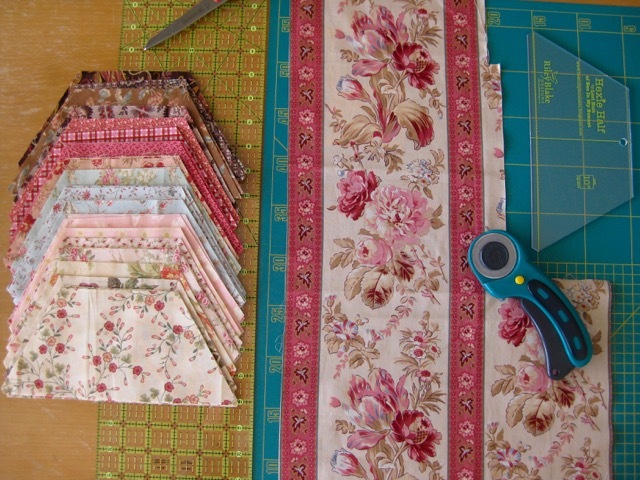 I'm so happy that you're crafting (and blogging) again.